I am a big fan of Bowl of Heaven and Banzai Bowls. Healthy, delicious, especially refreshing in the summer – but expensive and not something you have time to go out and buy very often. For some time now, I’ve been trying to perfect these bowls at home. This weekend, I think I finally got it right. Combine all ingredients (except protein powder) in Vitamix (or other high-speed food processor). Start on low speed. Gradually increase to highest speed, while inserting tool (the Vitamix one is called the “tamper”) into slot in top cover of Vitamix – never use tamper without the top of Vitamix on. Using tamper, continuously press mixture down into blades. This process takes 3-5 minutes and takes some muscle. Once the ingredients are almost blended, add the protein powder. I prefer a vegan, unflavored powder so it doesn’t interfere with the delicious taste of the bowl. Continue blending until mixture blends well but is not too defrosted that it becomes runny. It’s important to get the right consistency. Do not add any liquid to mixture! Divide completed mixture into two bowls. Top with fruit of choice. I like sliced bananas and strawberries. In addition, I topped with some granola, toasted coconut* and then drizzled with honey. Pretty and delicious. Now hurry and enjoy your creation! 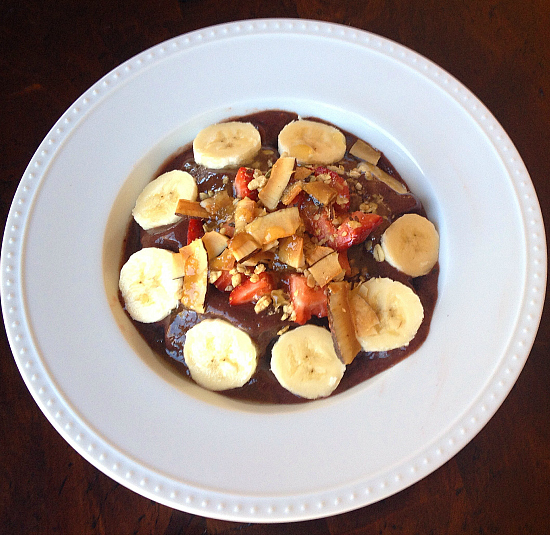 Posted in Food and Recipes and tagged Acai Bowl, banzai bowls, bowl of heaven, homemade, recipe, vitamix. Bookmark the permalink.